After the other day’s fiasco making something simple, I decided that I would hit up an old favorite for dinner to try and redeem myself. Nothing fancy or complicated, just something that I knew I couldn’t possibly mess up. With some salmon and chicken in the fridge, I opted for the salmon, and parmesan encrusted at that, with a side of steamed broccoli. It’s very easy to make. After removing the skin, I seasoned one side of the salmon with salt, pepper, and a generous amount of grated parmesan cheese. I used a generous amount of 60% vegetable oil and 40% olive oil (roughly 2-3 table spoons combined) in a pan, and heated it up so it was nice and hot, but not hot enough for the oil to smoke. I then gently placed the salmon, parmesan coated side down into the pan and let it cook for two to three minutes, then flipped it over and did the same to the other side. It came out perfect. 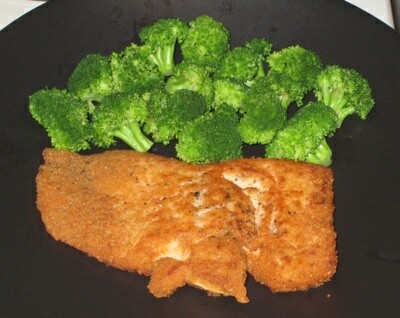 Seasoned with a smidgen of fresh lemon juice, and the side of perfectly steamed broccoli, it was enjoyed quickly and immensely.